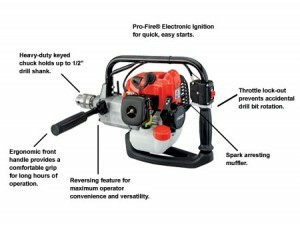 ECHO engine drills are the perfect tool for use in your garden, lawn or agricultural land. These high powered drills provide enough torque to easily make holes for planting and pest control among other applications. For use with a variety of different augers and bits, they are easy to manipulate and require far less work than hand digging or using lower powered electric options. ECHO’s EDR engine drill line comes with a keyed chuck for use with bits up to 1/2″ in shank diameter. Most often this includes a 2 1/2″, 3″ and 7″ auger attachment for easily removing soil and creating holes. The powerful two-stroke engine is versatile and comes with an innovative purge pump and all-position diaphragm carburetor so you can use it in any configuration without fear of flooding or starving the engine. ECHO also includes several safety features standard on their engine drills, such as a throttle lock-out to prevent bit rotation during setup. Of course, the reversible function is what makes the engine drill most convenient as it draws all of the soil and other materials back out of the hole for easy clearance. The EDR 260 packs 12-foot lbs of torque into a single handheld device, with a 25.4 cc engine. The whole machine weighs in at just 10.7 pounds so it is easy and comfortable to use without being too heavy or bulky. It is capable of up to 650 RPM in both forward and reverse. Priced around $550, this is an excellent choice for anyone who needs a lightweight drill for running an auger. The smaller of ECHO’s engine drills, the EDR 210, also has a lot to offer for small scale operations. It includes all of the same features of the EDR 260, but with a slightly downsized 21.2 cc engine. It weighs 10 pounds even, and is still capable of up to 450 rpm in forward and reverse. The EDR 210 is priced at $450, a notable discount from the EDR 260 while still packing a punch. Shank’s Lawn Equipment is a one of a kind dealer for all things lawn and garden. Their highly trained and experienced staff members can help you locate the right tools, parts, and service for any of your home and lawn equipment. They stock a wide variety of parts on hand for convenience and customer satisfaction. If you live in South Central Pennsylvania, Shank’s Lawn Equipment is your neighborhood service center. Their shop is located at 4900 Molly Pitcher Highway in Chambersburg, just off route 11. To get there from I-81, take Exit 10 to Marion. For people living outside of South Central Pennsylvania, Shank’s Lawn Equipment is able to ship parts to anywhere in the U.S. and Canada. Visit them online at www.shankslawn.com for more information today. This entry was posted in Uncategorized and tagged ECHO engine drills, engine drills, OEM Replacement Parts, Shank's Lawn. Bookmark the permalink.